Spinach is an annual plant, Spinacia oleracea, of the flowering plant family of Amaranthaceae and order Caryophyllales, which is popularly cultivated as a leaf vegetable. The term also is used for the succulent, edible leaves of this plant. Spinach has long been valued nutritionally, and is a rich source of vitamins A, C, E, and K, as well as a source of folate, fiber, magnesium, and several important antioxidants. However, its reputation as a rich source of iron is exaggerated due to the fact that the plant contains oxalic acid that negatively impacts the amount of iron (and calcium) actually available for absorption by the body (Herbst 2001; Bender and Bender 2005). The popular folklore regarding iron has been hard to extinguish, showing the lasting power of some myths in the human imagination. Some other species of plants also are commonly called spinach, including New Zealand spinach, Tetrogonia expansa in the Aizoaceae family, and Mountain spinach, Atriplex hortense in the Amaranthaceae family. Spinach belongs to the Amaranth family Amaranthaceae, a flowering plant family that contains about 160 genera and 2,400 species. Plants of this family have dark green leaves that are simple, opposite or alternate, with margins that are entire or coarsely toothed, and without stipules. The flowers are solitary or aggregated in cymes, spikes, or panicles and typically perfect (bisexual) and actinomorphic. The bracteate flowers are regular with 4-5 petals, often joined. There are 1-5 stamens. The hypogynous ovary has 3-5 joined sepals. 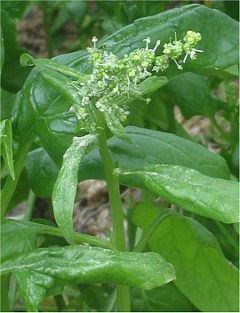 Spinach, Spinacia oleracea, is an annual plant. It grows to a height of up to 30 centimeters (cm). The leaves are alternate, simple, and ovate to triangular, either flat or curled. The leaves are very variable in size, from about 2-30 cm long and 1-15 cm broad, with larger leaves at the base of the plant and small leaves higher on the flowering stem. The flowers are inconspicuous, yellow-green, 3-4 mm diameter, maturing into a small hard dry lumpy fruit cluster 5-10 millimeters across containing several seeds. Spinach requires cool weather for optimal growth and may survive over winter in temperate regions. It is native to central and southwestern Asia. It was cultivated in Spain in the eighth century and it was the Spaniards who brought it to the United States (Herbst 2001). Spinach has a large nutritional value, especially when fresh, steamed, or quickly boiled. It is a rich source of vitamin A (as carotene), vitamin C, folate, and fiber (Bender and Bender 2005), as well as vitamin E, vitamin K, magnesium, and several vital antioxidants. Recently, opioid peptides called rubiscolins have also been found in spinach. The vitamin folic acid was first purified from spinach. To benefit from the folate in spinach, it is better to steam it than to boil it. Boiling spinach for four minutes can halve the level of folate. In popular folklore, spinach is a rich source of iron. Indeed, there is considerable iron within spinach. A 60 gram serving of boiled spinach contains around 1.9 mg of iron (slightly more when eaten raw), whereas a good many green vegetables contain less than 1 mg of iron for an equivalent serving. However, while spinach does contain a relatively high level of iron for a vegetable, the amount actually available to the body indicates its consumption does not have special health connotations as folklore might suggest, both because it is less than common expectations and because its actual nutritional value is diminished because of another substance in spinach, oxalic acid. The myth about spinach and its high iron content may have first been propagated by Dr. E. von Wolf in 1870, because a misplaced decimal point in his publication led to an iron-content figure that was ten times too high. In 1937, German chemists reinvestigated this "miracle vegetable" and corrected the mistake. A further issue is the bioavailability of iron, which is dependent on its absorption. Bioavailablility is influenced by a number of factors. Iron enters the body in two forms: nonheme iron and heme iron. All of the iron in grains and vegetables, and about three fifths of the iron in animal food sources (meats), is nonheme iron. The much smaller remaining portion from meats is heme iron (Williams 1993). The larger portion of dietary iron (nonheme) is absorbed slowly in its many food sources, including spinach. This absorption may vary widely depending on the presence of binders such as fiber or enhancers, such as vitamin C. Therefore, the body's absorption of non-heme iron can be improved by consuming foods that are rich in vitamin C. However, spinach contains high levels of oxalate. Oxalates bind to iron to form ferrous oxalate and remove iron from the body. Therefore, a diet high in oxalate (or phosphate or phytate) leads to a decrease in iron absorption. Spinach also has a high calcium content. However, the oxalate content in spinach likewise binds with calcium, decreasing its absorption. By way of comparison, the body can absorb about half of the calcium present in broccoli, yet only around 5 percent of the calcium in spinach. Oxalate is one of a number of factors that can contribute to gout and kidney stones. Equally or more notable factors contributing to calcium stones are genetic tendency, high intake of animal protein, excess calcium intake, excess vitamin D, prolonged immobility, hyperparathyroidism, renal tubular acidosis, and excess dietary fiber (Williams, 1993). Oxalic acid also is the same substance that renders spinach its slighly bitter taste, which some prize and others find disagreeable. Boiled spinach and corn flour paratha from Punjab, India. Semi-savoy is a hybrid variety with slightly crinkled leaves. It has the same texture as savoy, but it is not as difficult to clean. It is grown for both fresh market and processing. "Five Star" is a widely grown variety and has good resistance to running up to seed. In Australia, a significant percentage of people erroneously identify chard (locally known as silverbeet) as spinach, despite the fact that both spinach and chard are labeled appropriately in stores (Stanton 1995). Chard (Beta vulgaris, Amaranthaceae), also known as spinach beet or perpetual spinach. Orache (Atriplex species, Amaranthaceae), also called "French spinach" or "mountain spinach." Good King Henry (Chenopodium bonus-henricus, Amaranthaceae) and other Chenopodium species, also called "Lincolnshire spinach." In Indonesia, the word bayam is applied both to certain species of amaranth commonly eaten as a leafy vegetable, and to spinach, which is rarely seen (only in certain supermarkets), but well known from "Popeye, the Sailor Man" cartoons, where the main character receives his extaordinary strength from eating spinach. New Zealand spinach (Tetragonia, Aizoaceae). The greens of various nightshade, legume and cucurbit species are also known as spinach, wild spinach, African spinach, "Thermadorian spinach" or morogo (in Southern Africa). Blazey, C. 1999. The Australian Vegetable Garden: What's New is Old. Sydney, NSW: New Holland Publishers. ISBN 1864365382. Cardwell, G. 2005. Spinach is a good source of what? The Skeptic 25(2): 31-33. ISSN 07269897. Rogers, J. 1990. What Food is That? And How Healthy is It? The Rocks, Sydney, NSW: Lansdowne Publishing Pty Ltd. ISBN 1863028234. Stanton, R. 1995. Rosemary Stanton's Complete Book of Food and Nutrition. East Roseville, N.S.W. : Simon & Schuster. ISBN 0731805380. Williams, S. R. 1993. Essentials of Nutrition and Diet Therapy. St. Louis, MO: Mosby. ISBN 0801679230. Maue, D., S. Walia, S. Shore, M. Parkash, S. K. Walia, and S. K. Walia 2005. Prevalence of multiple antibiotic resistant bacteria in ready-to-eat bagged salads. American Society for Microbiology Meeting, June 5-9, 2005. This page was last modified on 14 October 2016, at 15:51.